3/10/2011 - Student of the Elements is another art-inspired design (sadly, from before I started noting where the art was from). It felt distinctly red and blue and so I started looking for an unexplored overlap between those two colors. As looting has only recently been proposed as a red mechanic, there is a lot of virgin territory opened up there that I would like to explore. Since blue is in it, we don't need to try out of any of the fun variations Mr Woodward proposed a couple weeks ago, but we do need to add something red. I like the idea of a wizard who can filter cards and burn things tim-style, but I didn't want them just stapled together blindly, so I made the burn conditional on what you filter out of your hand. One could argue that it's "too easy" to get the damage since players generally want to discard land anyhow, but I put it to you that we want to reward players for doing what they like and we don't want to force tension into what should be a simple utility card by making them choose between an optimal filtering and bonus damage. Another option (at a higher mana cost) would have been something like this: "T: Draw a card. 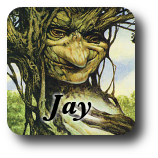 You may discard a card. 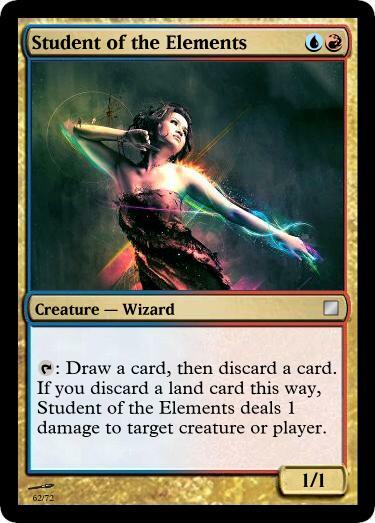 If you do, Student of the Elements deals 1 damage to target creature or player." Meh. @Kirblar024 offers the suggestion of adding "If you discard a non-land card this way, tap or untap another target permanent." I like that because you get an effect regardless of what you discard. That ability could also be very helpful if you're mana screwed: You get to discard an expensive spell for a chance at a much-needed land and you can untap one of the lands you do have. Perhaps a little too close to this gentleman? Pretty cool idea and a pretty cool card.